Neil Tennant is sitting in the Wolseley a day before he and Chris Lowe go west, flying from London to San Francisco to prepare for Pet Shop Boys’ headlining performance on Saturday night at the Coachella Valley Music and Arts Annual Festival. “Is it Coach-ella or Co-a-chella?” Tennant wonders. He’ll find out soon enough. Beforehand, PSB are shaking off six months of rust—they finished the most recent leg of their Electric world tour in Mexico last October—with warm-ups this week in Oakland and Ventura, California. And there’s been a bit of fine-tuning. “We could feel the audience getting a bit shifty in their seats mid-show with the new songs,” says Tennant. So he’s promising “a traffic jam of hits” on Saturday night. It’s been a staggering thirty years since the very first, “West End Girls.” Over time, that song has become the kind of classic to which all forms of human life have met and mated (Tennant and Lowe are always being reminded of that fact by the ardent fans who pay extra for a pre-show meet and greet). Chart-meister Pharrell Williams confessed to Tennant in Toronto recently that he wished it was his song. On Saturday night, Pharrell finishes his set at the Outdoor Theatre just as PSB walk out onto the Mojave Stage, so he’ll make their gig in time to hear the song he wished he’d written irresistibly elided with a new number, the EDM-ish raver “Fluorescent.” That’s a killer one-two that should shake the starry, starry night over the California desert. It’ll also be a measure of the way Lowe and Tennant constantly revise and refresh their material. “Traffic jam of hits” or not, I’ve never seen a show of theirs which left me feeling like I was listening to a mere run-through of old faves (even though there are dozens of them). The sound is always evolving and so is the masterful showmanship. 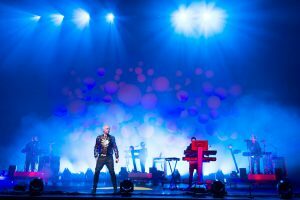 Pet Shop Boys’ only real peer is Kraftwerk, with whom they are coincidentally co-headlining Moogfest in Asheville, North Carolina, in a few weeks. Tennant agrees it’s a challenge translating their intelligent spectacle to a festival setting: “It’s a bit more nerve-racking because it’s not your audience. You’ve really got to fight.” He remembers one rock festival in northern Spain where the audience was particularly ill-disposed to PSB’s brand of pop music. “But we followed Beck, and we were saved, in my opinion, from being canned off stage because Beck stood at the side of the stage throughout our performance dancing and singing along with his bass player, and the audience thought, Who are we to disagree? As Monica Lewinsky once said to me, ‘Oh, I know who you are. I grew up in Los Angeles in the eighties.’ So did Beck. Tennant’s wracked nerves aside, PSB actually have brilliant form at the most famous festival in the world. I’m talking about Glastonbury, where, on another Saturday night in 2010, PSB were playing on something called the Other Stage while Muse headlined the Pyramid Stage. “The night before, when the Flaming Lips were playing the Other Stage, Chris went to see them and there were just a few thousand people, so we were reconciled to the fact that no one would come to see us. When we got there the next day, our production manager said the actual physical space for the audience in front of the stage was already full. In the end, 50,000 people watched us, the same number that watched Muse. It was absolutely one of the best experiences,” remembers Tennant. So perhaps it’s a promising coincidence that Saturday brings a rematch: Muse is playing on the Coachella Stage at the exact same time Pet Shop Boys take to the Mojave. Now Tennant must leave to pack his giant-size Tumi for tomorrow’s trip, but there’s one pressing item before he goes. Monica…ahem…Lewinsky? “We met at Ian McKellen’s 50th birthday party. She looked iconic, like a walking Andy Warhol screen print. Liz Taylor, perhaps.” The history of the Pet Shop Boys is crammed with hundreds of similar stories. Can’t wait to see what Coachella adds to the almanac.